Yes, rabbits can eat celery, but it should only be a very small portion of their diet and it should be cut up into 1 inch sections when you give it to them. A rabbit’s diet should consist mainly of hay (dried grass) and be supplemented with vegetables and pellets. First, let’s look at what celery is so that we can better understand the benefits and cons of feeding rabbits celery. Celery is a vegetable in the family Apiaceae (which includes carrots and parsley). Both its fibrous stalk and its leaves can be eaten either raw or cooked (by both rabbits and humans). Celery has a savory taste and is full of water. Many rabbits develop a fondness for celery due to its high sugar content (by rabbit standards) and love eating it. There are a couple of benefits (other than taste) when you feed rabbits celery. Firstly, celery contains many vitamins, minerals, and nutrients such as calcium, choline, fiber, folate, folic acid, iron, magnesium, phosphorous, potassium, zinc, vitamin A, several B vitamins, vitamin C, vitamin E, and vitamin K to name a few (all of which are beneficial for rabbits’ overall health). Secondly, celery also helps to keep rabbits’ teeth in check due to how crunchy and difficult it is to chew. Did you know that rabbits’ teeth never stop growing? While that is very cool, it also means that their teeth can grow straight into their gums and mouth if left unchecked. This is very painful for them and dangerous as well. 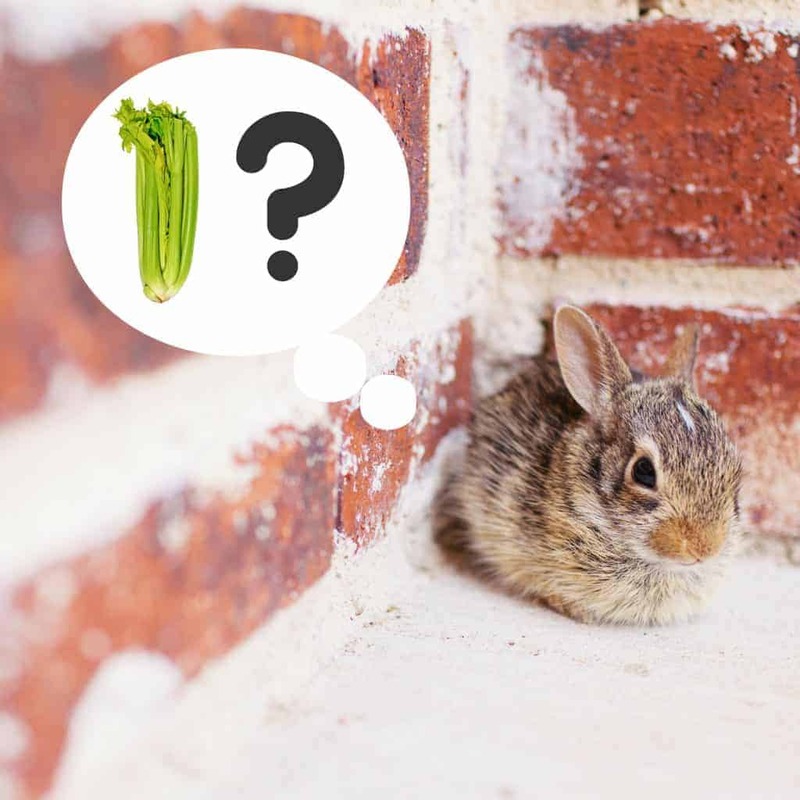 While celery is generally considered safe for rabbits, there are some cons to consider. The most dangerous of which is celery strings (yes, celery strings can be dangerous). Celery strings can get stuck in a rabbit’s stomach and can cause blockages (which may sound minor but can be deadly for rabbits) They can also get stuck in rabbits’ teeth and can lead to infection. It is often recommended to cut up any celery for your rabbit to help prevent the celery strands from getting caught (you can cut it up into small one-inch sections). Another con of celery is that it can cause an upset stomach. Since rabbits are natural foragers, many people assume that they can eat almost anything. But this is not true. Rabbits have delicate stomachs which can be easily upset (by new foods, by too many vegetables, by too much sugar, etc.). A good way to avoid this is to introduce new foods (especially vegetables) very slowly and in small pieces. If you see soft or watery stool (poo), then their stomach is not a happy camper! The final con of celery for rabbits is sugar. While humans think of celery as a health food (and consider its sugar content meager), for rabbits, celery is high in sugar (for what they require), and it should be considered more of a treat than a daily meal. A general recommendation is to feed your rabbit no more than ½ a celery stick daily. There are some benefits to feeding your rabbit celery (it contains many vitamins, minerals, and nutrients and helps to keep your rabbit’s teeth in check), and there are also some cons (celery strings can cause blockages, celery can cause an upset stomach, and is high in sugar for rabbits). Since rabbits do not have constant stomach movement (called peristalsis), they are very susceptible to GI stasis (which is where the digestive tract either slows down or stops completely). This can be deadly for rabbits. To help prevent this, a rabbit’s primary diet should consist mainly of hay and be supplemented with vegetables and pellets. Starchy vegetables, fruits, seeds, and nuts (or any “treats”) should be limited. Celery should be limited, and a general recommendation is to feed your rabbit no more than ½ a celery stick daily (and you should cut it up into small one-inch sections).